The fear of loud noises is considered a phobia, which is an intense response to a situation that your pet perceives as fear inducing. The pets response is out of proportion to the stimulus they fear. Phobic responses are very similar to fear, however they are extremely exaggerated. The ideal way to treat noise phobias is for you to train your pet by using behavior modification techniques such as systematic desensitization and counter-conditioning. These training methods are to be taught when noises from things like thunderstorms or fireworks are unlikely to occur. Do NOT scold or punish your pet when they are frightened. This only confirms to your pet that there is something to fear and will make your pet feel more anxious. Do NOT fuss or attempt to reassure your pet when they are scared as it will only reinforce the behavior you are trying to correct. Practice training your pet to settle and focus on command, use rewards such as favorite treats, toys and blankets. It is also good to associate this training with a favored location of the house. Somewhere that the noise may be less obvious. Use background noise like music or television to distract them. Then when a storm or fireworks occur use your training commands to settle and focus your pet in the area you have chosen. During storm season you can use this area and comfort rewards to contain your pet when you need to go out too. 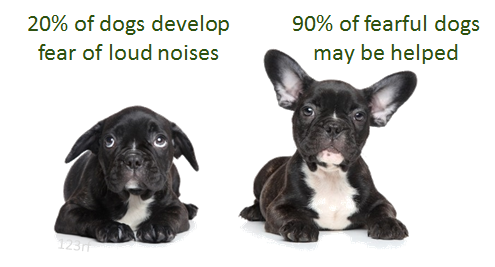 There are calming pheromone sprays and diffuser’s that can be placed in your pets quiet space. The use of oral calming supplements is proven very effective also. These supplements are all natural and do not cause drowsiness, however they do ease anxiety. Check with your veterinarian for the one that will be best for your pet’s needs. Sometimes the need for medical intervention is necessary. Your veterinarian can prescribe medications to decrease your pet’s anxiety when all of the suggestions above do not help.